Maybe you noticed, but I’ve kinda got a thing for television. In that I love it. A lot. And I’ve also kinda got a thing for Nick Hornby. (In that I love him.) (A lot.) 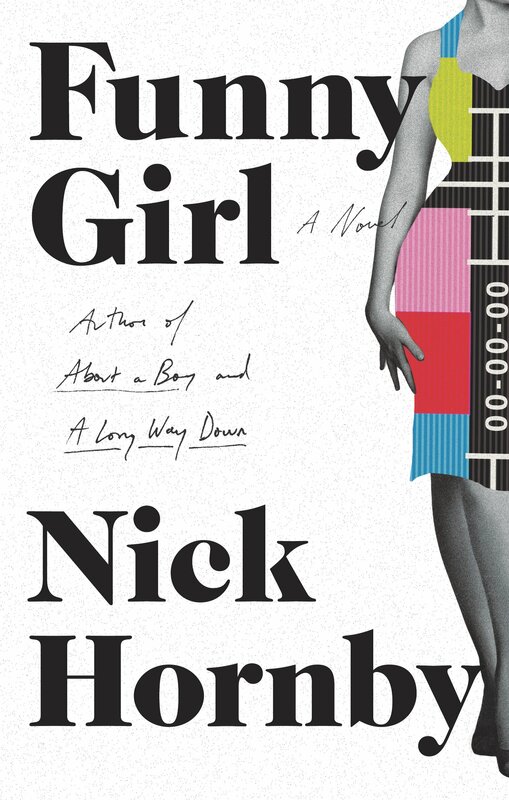 And the spine of Nick Hornby’s latest novel, Funny Girl, is a television show, a fictional mid-1960s BBC comedy called Barbara (and Jim). The novel is the story of the stars, writers and producer/director over the course of the show’s four series, and of the way Britain was changing in the 1960s. It’s also a story about high-brow culture versus low-brow culture, about who gets to make the decisions about which is which, and whether we should find value in one over the other. Funny Girl’s titular character is an actress named Sophie Straw, but arguable the most compelling character is Barbara (and Jim)’s writer/producer, Dennis. Dennis is not a comedian, not as a writer or as a performer, and his colleagues regularly mock his attempts at jokes. He’s an Oxbridge intellectual, often the only square in a roomful of bohemians, “a BBC man from his head to the holes in his socks,” as Sophie puts it. But he loves comedy just as much as anyone else that works for the series, and that sets him apart from his BBC contemporaries and his thoroughly unfunny wife as much as it binds him to his co-workers. Dennis is the character that most exemplifies the way Britain was changing over the course of the 60s. Sophie, a woman with dreams that far exceed the life of a Blackpool beauty queen, a woman who sees an affair with a married man as an unappealing but necessary step towards accessing a television for Sunday afternoon I Love Lucy reruns (her own personal church), is already a part of Britain’s future, as are Bill and Tony, Barbara (and Jim)’s writers, two men who met in a jail cell after being arrested for attempting to seduce the same undercover policeman in the same men’s bathroom, and Clive, Sophie’s self-absorbed straight-man co-star and on-and-off boyfriend. Dennis, just a bit older than the rest of them, is a man out of a different era, and a different culture. He lives on the border between high-brow and low-brow. And Dennis is the character invited onto a national television show to debate whether the two can co-exist on the BBC. To argue that comedy, specifically the situational television comedy, has value at all, let alone on a network funded by taxpayers. This isn’t an argument that’s specific to the 1960s. You still see it now, 50 years later, any time a news organization attempts a conversation about pop culture (even on a pop-culture-specific blog), any time someone proudly announces that they “don’t even own a TV.” There’s a sort of hierarchy to the acceptability of culture, one that goes something like literary fiction > “film” (independent/foreign/“important”) > “prestige” (or really just cable) television > commercial movies > network dramas > genre fiction > single-camera network comedies > multi-camera network comedies > reality television > CW programming > genre television (this order is open to some debate, and probably missing several billion categories), and even when a particular piece of culture manages to break out of its usual role in this hierarchy, as has happened with comedies like Parks and Recreation and Community, or dramas like The Good Wife, and gain respect, it’s often seen as an exception that proves the rule, or it’s still undervalued by some who don’t see exceptions as possible. The differences between Tony and Bill are what give Barbara (and Jim) its tension. It premieres a year before the real show Till Death Us Do Part, the program that inspired All in the Family and fundamentally changed what a situation comedy could do, and while Barbara (and Jim) marks a new era in television, from Barbara’s broad Blackpool accent to the titular parentheses indicating that Barbara is the boss and Jim’s along for the ride, it is not, to Bill’s chagrin, the bold step forward that Till Death Us Do Part, with its head-on confrontation of racism, sexism and personal politics, would be. As Bill and Tony’s opinions about their show diverge, the comedy on Barbara (and Jim) becomes broader, more situational, and then begins to disintegrate as Barbara and Jim head into marriage counseling for the course of the show’s fourth and final series. They become a metaphor for their writers, whose differences have finally grown too significant to hold their partnership together. The novel doesn’t present either Bill or Tony as right about comedy. Tony’s methods are more conventional. He writes for the every man (or woman). He just wants to make people laugh, and to have a steady paycheck. And he’s successful at both. And while Bill is perhaps more ambitious, using his writing to challenge his readers, and wishing for an audience he sees as superior to the one he can reach with Barbara (and Jim), he’s also less traditionally successful. The audience he wants, the one for a searing, semi-autobiographical novel of a gay man in 1960s London, is much smaller than the one for a TV comedy about a modern marriage, and there’s very little overlap between the two. Funny Girl takes place in a specific period of time because it was one of marked change, and series like Barbara (and Jim) were only a small part of that. By 1967, the year the program goes off the air, it was no longer illegal to be gay in the United Kingdom. Divorce was more prominent, and more socially acceptable. Women had more autonomy. But many of the debates at the center of the novel are still taking place today. We still argue the value of culture, still disagree on comedy (hence the collective critical groan every time Modern Family takes home another Best Comedy trophy, despite its continued commercial appeal). There are still viewers who can’t see the difference between The Good Wife and any other case-of-the-week drama, who think single-camera means quality where multi-camera doesn’t. These debates rage on. And they will, in different shapes, for years to come. The point that Funny Girl best makes is that these arguments are worth having. They won’t be solved by one great television show, or one network changing of the guard. Barbara (and Jim) goes off the air and it’s replaced by new series that reflect and affect the world, as happens with every television show, and these same disagreements mutate with their times and carry on.